On Tuesday a prominent leak source showed off what are claimed to be front panels for all of Apple's 2018 iPhones, which if authentic, reaffirm expected features. The panels are sized at 5.8, 6.1, and 6.5 inches, according to Ben Geskin. All three point to edge-to-edge displays, and iPhone X-style notches to accommodate a TrueDepth camera for Face ID and animoji. 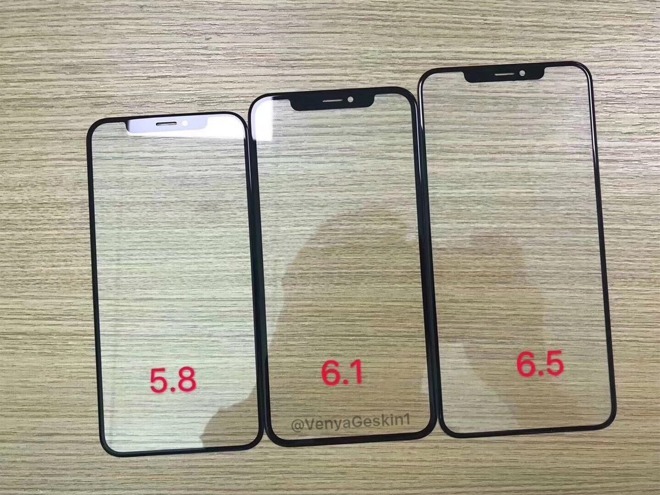 Significantly the 6.1-inch panel appears to have slightly thicker bezels, which might back indications that it will use LCD technology instead of the OLED built into its companions. The origin of the panels is unknown, but parts leaks are common ahead of iPhone launches, and Geskin has produced authentic leaks in the past. Using LCD on the 6.1-inch phone should allow Apple to sell it at a cheaper price, likely between $600 and $700. While the 5.8-inch phone may be cheaper than the iPhone X, it's still expected to cost between $800 and $900, mostly because of the expense of OLED coupled with Apple's desire to keep up profit margins. Besides the 6.1-inch LCD iPhone first rumored in January, Apple is rumored to add two new OLED models to its iPhone lineup this fall including a 5.8-inch iPhone X replacement. A 6.5-inch OLED "iPhone X Plus" is also supposedly in the works. All 2018 iPhones are said to boast logic boards built on substrate-like PCB (SLP) technologies first adopted by iPhone X and iPhone 8. The 5.8- and 6.5-inch OLED iPhone models will sport stacked board designs like iPhone X, while the 6.1-inch LCD model will stick to a traditional single-layer layout, Kuo said. Manufacturers will adopt a finer pitch of 28-30 nanometers on the boards, down from the 30-35 nanometers applied to 2017 phones, as part of efforts to reduce PCB size and improve energy efficiency. Current price predictions put the 6.1-inch LCD phone pricing at between $600 and $700. Moving up the product line, the 5.8-inch OLED model is expected top be between $800 to $900 and the 6.5-inch OLED "iPhone X Plus" will be priced around $900 to $1000. All the two OLED models will likely ship in quantity in September and early October. One report claims that the 6.1-inch model will be pushed to November because of difficulties cutting an iPhone X-like "notch" out of a LCD panel.